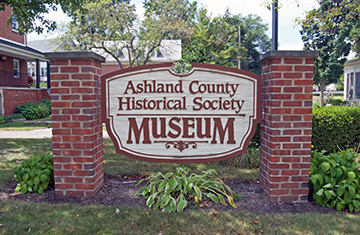 The Ashland County Historical Society is located in the heart of the Center Street Historical District of Ashland, Ohio. Its campus consists of three houses. The Manor House was the first purchased. It was built by J.P. Cowan in 1859 and sold to P.A. Myers in 1906 to be given to his son Guy and his new bride Kate as a wedding present. It was likely the first brick structure on the street. Guy and Kate resided in the home until P.A. 's death. After that, several Myers relatives lived there. 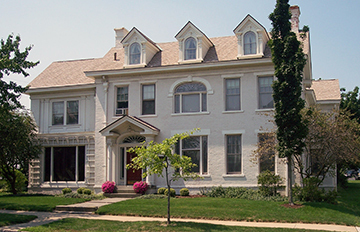 Then in 1952, it was given to Ashland College to be used as a residence for the President. In 1969, the University used it as a Historical Center until the sale. In 1981, the Historical Society bought the house, after the generous people of the county supported a fundraiser. The Carriage House followed. Then in 1996, thanks to a generous bequeath from Eloise Ridgeway Noonan, a long-time board member and supporter, the Noonan House was built. 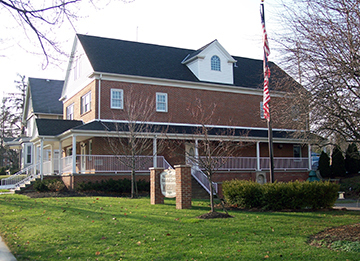 The office is located in the Noonan House and is open Monday through Thursday from 10:00 am to 3:00 pm. The museum buildings are open for tours on Monday and Wednesdays from 11:00-2:00 during the months of April thru December. Special or group tours can be arranged by calling the office in advance at (419) 289-3111. The museum is free and open to the public. The Ashland County Historical Society is located at 420 Center Street, two blocks south of the downtown business district (Main Street) and adjacent to the Elks Lodge. Parking is available behind the museum. Looking for photographs of Historic Ashland? Click here to link to Photofinale where there are currently over 60 different images to choose from. You are able to choose and order the photos directly from the site. You can also stop in at Spectrum Photo on Claremont Avenue and order the photos there. Directions from US-250 E / I-71: Head west on East Main Street/US-250 E. Upon entering downtown area, turn left at light onto Center Street/State Route 60 S. Museum on right 0.2 miles at 420 Center Street. Museum office in the red brick Noonan House. Parking available behind museum. Directions from US-250 W: Take the first left toward Orange Road (signs for OH-58). Turn right onto Orange Road (OH-58). Slight left onto Union Street. Turn right onto East Main Street. Take the first left onto Center Street/State Route 60 S. Museum on right 0.2 miles between Elks Lodge 1360 and DeSanto & Kellogg, Attorneys at Law. Parking available behind museum. Directions from US-42 N & S: At the stoplight near the Brethren Care Village, turn toward OH-511 N and follow the curve to the left. At the stop sign, turn left onto Center Street/State Route 60 N. Museum on left about 1.7 miles at 420 Center Street. Enter the Historical Society at driveway just before the second house on left, which is the red brick Noonan House. Parking available behind museum.